Lizards are the most successful of the Reptile group. Most have a well developed head, four well developed limbs, and a long tail. Some lizards can shed their tail when attacked by a predator and then regenerate the tail. Most species reproduce by laying eggs. Most have ear holes on the head. Lizards can vary leg length, tongue type (short or long, forked or not), scales can be large, smooth, rough, overlapping, small, stud like or any combination. 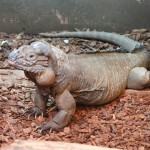 Argus monitors are among some of the largest lizard species in the world and are related to Komodo dragons. 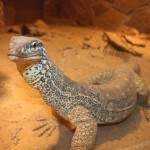 In order to appear larger if threatened, Argus monitors stand on their hind legs and use their muscular tails to balance. They’re avid diggers and create large burrows to spend the hotter portions of the day in. If necessary, an Argus monitor will take over an existing burrow. They are 4 to 5 feet in length. Their diet consists of fish, crabs, small birds, small mammals, insects, and even other monitors. 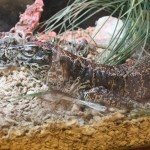 Recent studies suggest that the Marine Toad infestation has severely damaged the population of Argus monitors. It is estimated that numbers have dropped by as much as 90% in many areas. Scovill Zoo’s only Argus monitor is a female named Keuka. 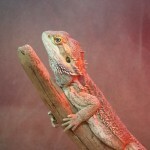 Our Island Bearded Dragons can be found in the Herpaquarium. They grow twelve to eighteen inches. In Australia they live in dry forests, woodlands and scrubland. They forage for small insects and vegetation near its perch. If confronted by a predator (birds of prey, monitor lizards, or snakes) it erects its black throat frill or “Beard” and presents a wide, open mouth. Both the male and female can be territorial. The female can lay 15 – 30 eggs and will bury them in sandy soil. Their upper jaw can move independently from the skull. Long limbs, long toes and long claws are all useful when it climbs trees. Its agile tail helps, too. A white spot is the so-called parietal eye, an opening that allows light to reach the pineal organ in the brain. Many lizards have these “eyes,” which have a basic lens and retina but don’t form images. Third eyes probably increase sensitivity to light and dark. They eat Small mammals and arthropods. Scovill Zoo’s Green Tree Monitor’s name is Flash. He is a male and came to us from the National Zoo in 2013. Rhino iguanas are much more terrestrial than green iguanas which allows them to live in rockier and drier areas. They are rarely found in trees or even forested areas. Rhino iguanas get their name because of horn-like structures that are found on the heads of males. It is not known if these structures serve any purpose, but they may aid in courtship. Male iguanas go through elaborate courtship behaviors of head bobbing and erecting their spines along the back. Normally iguanas are quite timid and will flee if approached, but during courtship the males can be quite aggressive. The rhino iguana is not as long as the more common green iguana, but can be over twice the weight. Their total body length of up to 4.5 ft. 10-20 pounds. They are omnivores and will eat a wide assortment of vegetable matter, invertebrates, small mammals and birds. Because their populations are restricted to islands, rhino iguanas are especially vulnerable to environmental as well as man made disturbances. Iguanas are often eaten as food because of their accessibility and the relatively poor economic status of the people on these islands. The iguanas are protected from wide-scale release in the pet trade and zoos are playing an integral role in the conservation of this species. Tallulah is Scovill Zoo’s female rhino iguana. She lives in the large center exhibit inside the herpaquarium. She arrived at Scovill Zoo in 2011 from the Mississippi River Museum. Geckos are small, vocal, and usually nocturnal lizards. Some are very agile climbers and can go up smooth, vertical surfaces, even overhangs. There are desert species that live in burrows or rock crevices and species that live in tropical and subtropical countries. Geckos are unique among lizards in producing an array of sounds. These sounds are used to attract mates or to defend territory. It also helps nocturnal geckos to find each other. Females often lay pairs or single eggs at a time. Sometimes several will lay their eggs in the same pile. Leopards Geckos can grow up to 10 to 12 inches long. They are common in South Asia including Afghanistan, Pakistan, and western India and live in warm, arid environments. In the wild they will eat insects, spiders and scorpions. At the zoo we feed them crickets dusted with a powdered vitamin and mineral supplement. The female first reproduces during her second year of life, laying 2 eggs at a time and burying them in the soil. The young geckos hatch in 9-14 weeks. They are banded and more brightly-colored than the adults. The leopard gecko has movable eyelids, unlike most geckos whose eyes are covered by an immovable, transparent scale. It also lacks adhesive toe pads that are found in many arboreal geckos. The leopard gecko is most active at dusk. It stores fat in its tail when food is abundant. This characteristic is found in many lizards that live in dry environments where food is seasonally abundant. 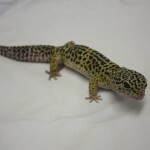 Leopard geckos are often kept as pets. They are easy to care for, and they often breed in captivity. However, it is important to keep males separated from one another, as they will fight. Skinks and their relatives are the largest group of lizards. The skinks are mostly long and slender, a few species have no legs. Skinks can be found around the world but are more numerous in tropical and subtropical climates. Most live on the ground but some can climb. Some skinks lay eggs, whereas other species will carry the eggs and give birth to live young. This large, slow moving animal is one of Australia’s most familiar reptiles. It lives in a wide variety of habitats and is often seen on roads. 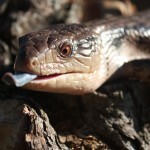 The blue-tongued skink has a wide ranging diet and actively forages for snails, insects, carrion, flowers, fruits, and berries. It will also scavenge for leftovers at picnic sites. One of South America’s largest terrestrial reptiles, the tegu shows similarities with monitors. It has powerful limbs and long claws for digging. It uses its forked tongue to “taste” the air. It will eat insects, invertebrates, birds, small mammals, lizards, and carrion. They are good swimmers and live on river banks and in forest clearings. When threatened, they will bite and scratch with their claws. They also use their tails as clubs. They can walk on their hind legs and communicate with each other by making loud snoring noises. The Glass Lizard can grow up to 4 ½ feet long. In the wild they eat terrestrial snails, insects, earthworms, mice, and bird eggs. At Scovill Zoo we feed them crickets (dusted with a powdered vitamin and mineral supplement) and baby mice. They can live up to 20 years in captivity. Glass Lizards lay six to ten soft-shelled, white eggs, each about 1 ½ inches long, are laid in June. They require 6 to 8 weeks to hatch. Glass lizards are named for the characteristic, among some species, of having a very brittle tail. The tail breaks off readily when grabbed, an adaptation that may save the lizard from a predator. It breaks along specific fracture planes, there is very little bleeding, and a smaller tail soon regenerates. The European glass lizard, or sheltopusik, is a species that does not have an extremely fragile tail. Although people sometimes mistake glass lizards for snakes, glass lizards differ from snakes in several ways. They have movable eyelids, in contrast to the clear, immovable scale covering the eye of a snake. External ear openings are present. The forked tongue is shorter and thicker than that of a similar-sized snake. The blunt teeth crush and chew the food, whereas a snake’s needle-like teeth hold the prey, which is swallowed whole. The tail, at least as long as the body, is much longer than a snake’s short tail. The belly has many rows of small scales instead of one row of wide scales. Most of the scales on the body are under laid with bone, making the glass lizard harder and stiffer than a snake. A long groove runs along each side of the body. The scales of the groove have no bone, so the skin is more flexible. The lateral folds, or grooves, allow the back and belly to move apart. The body can then expand during breathing, after a large meal, or when a female is carrying eggs. The shed comes off in pieces. Glass lizards evolved from typical lizards, and they have many close relatives with legs. The European glass lizard has two vestigial legs, one on each side of the cloaca. The legs are reduced to tiny cylinders. The European glass lizard is active during the day. It moves slowly over the ground with serpentine movements, although it can slither away quickly if disturbed. When held, the glass lizard often twists and rolls along the long axis of the body. There are 3 species of glass lizards in North America, including one, the slender glass lizard, in Illinois. 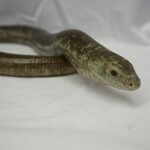 The slender glass lizard lives in dry grasslands and dry, open woods. It rarely burrows except to hibernate. Its tail is extremely brittle. This species can grow up to 3 ½ feet long. Capula, Massimo. 1989. Simon & Schuster’s Guide to Reptiles and Amphibians of the World. Simon & Schuster/Fireside. New York. Grzimek, Bernhard. Grzimek’s Animal Life Encyclopedia, Vol. 6. Van Nostrand Reinhold Company. New York. Smith, Hobart and Edmund Brodie, Jr. 1982. A Guide to Field Identification, Reptiles of North America. Western Publishing Company, Inc. (Golden Press). New York. Alderton, David. 1986. A Petkeeper’s Guide to Reptiles & Amphibians. Salamander Books, Ltd. New York.